Cruising is a BIG INDUSTRY in the island of St Lucia ... a sector that is rapidly increasing due in part to the growth and competitiveness of Real St Lucia Tours having entered the market. Do you have doubts about cruise vacations to St Lucia? Well, you should because of the reasons outlined below. Some cruise ship schedules are so appalling that you scarcely have an opportunity to see anything at all. The time that one spends in port can be so restricted that your only alternative for optional tours is to board one of the cruise line's buses when you disembark in port and travel around with other cruisers just looking out the window at a slow pace. Do you call that "getting around to see and do it all?’ Oh hell, no! Read this sentence below repeatedly and let it sink in. Are you ready! When you are on your cruise ship it ...When you are not on it, GET AS FAR AWAY AS POSSIBLE FROM IT.! Don't let the cruise line staff persuade you into buying tours that they sell ... transportation and tours are easily arranged independently of each other and you'll save a lot of money and improve your vacation experience considerably. Are you thinking of booking your own shore St Lucia excursion? Well that will be one of the best decisions that you would have made as it will not only save you money, but it will also give you with the opportunity to choose from a unique and assorted excursions, small groups tours, customized schedules and the liberty and all the information that you would require if you choose to go on your own. Our tour schedules are specifically designed to work with Passengers from NCL - Norwegian Cruise Lines, Princess Cruise lines, Royal Caribbean, HAL - Holland American Cruise Lines and Carnival Cruise Lines. From the tallest seashore cliffs, to splendid volcanoes, to lush tropical beaches, St Lucia is an exceptional and fascinating get-away destination. A view of St Lucia from a cruise ship is breath taking and witnessing the island by land on a Real St Lucia Tours shore excursion can be a once in lifetime experience that you should not allow to pass you by. One day is insufficient time for cruise ships visitors to see all that the island has to offer. However, the picturesque island of St Lucia have numerous places to go or sites to see for a one-day shore excursions or short visits, which will compel you to return to the island for much longer a period. Cruising the Caribbean aboard your favourite cruise liner? Searching for an exhilarating shore excursion on St Lucia? Well, Look no further! We have the tour for you. Come join our Half and Full Day Shore Excursions going to the popular natural attractions on the island. You travel aboard relaxed air-conditioned coaches and minivans thru St Lucia rainforest stopping for a stimulating dip in our crystal clear waters, experience zipline tours or to integrate with warm and friendly local inhabitants, taste local delicacies, take photos, shop along the routes and enjoy lots more. We give outstanding value and the service is unbeatable. However, the shocking thing you will find about shore excursions is that the tours being offered by the ship are always overpriced. The cruise ships often MARK-UP the activities and tours well over the list price. This is usually done with the explanation that the price includes transportation. It is not uncommon for a tour that we sell for US $65 will cost you US$100 or more if purchased through your cruise line. More often than not, our US $65 rate is inclusive of transportation cost! There are times that the price may require a five minute cab ride; however you will still save US $25 or so per person. And if your intended departure date to proceed on your cruise is still far away, then you can go on to our website: www.realstluciatours.com, which will furnish you with lots of information on a variety of activities that you can do, or places/picturesque sites you can visit. Since we live in St Lucia, who is in a better place to know what works and what doesn't in planning a cruising vacation? We are the destination specialists for St Lucia. Your local travel agent often times try to be an expert on every destination that you (next client) wants to visit on vacation. Have you ever asked of your local travel agent for suggestion for example, to a good restaurant in St Lucia that one can dine? I can assure you that they will be unable to come up with an answer. The first thing they'll have to do is to figure out what COUNTRY it's in. However, if you are contemplating a cruise to St Lucia, Real St Lucia Tours are the experts that can help you explore a “real paradise”, to the fullest and make sure each and every port you intend to visit will be the most pleasurable and unforgettable site of your tour or cruise to the beautiful Island of St Lucia. We can get you fun and exciting tours, activities, and services planned around your cruise ship schedule. Our staff at Real St Lucia Tours will pick you up direct from your wharf, take you on our excursions, and return you well ahead of your sailing time. Although our shore excursions features similar popular destinations as that of your cruise ship, however with Real St Lucia Tours you will definitely save money because our tours are offered at a great value. We also offer a Rent-a-Car Service just in case you want to explore the island on your own. 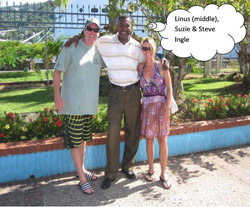 Real St Lucia Tours, your guide to St Lucia shore tours welcomes you to the island of St Lucia. We offer a variety of excellent cruise excursions and shore tours as well as for Resort and hotel visitors and provide our clientele the best of St Lucia including island, historical and snorkeling tours, private sailing and hiking adventures, private snorkeling and swim with dolphins, Gros Piton Trail Climbing, water sports or relax at a tranquil beach to name but a few. We are no doubt one of the best tour operators as we provide firsthand information on each and every tour we offer, and recommend only the excursions that work best with your port schedule as well as Hotel and Apartment location. The ball is in your court; you have the option in deciding what you want to see/do or if you want us to put a package together for your St Lucia cruise. So don't wait, let's start working on your St Lucia adventure today! Just click here and you will be directed to our realstluciatours web site. Contact us via the e-mail or the telephone number provided and we will do the rest. I can assure you that you will not regret it and you will return sooner rather than later. See you soon. Learn about Car Rental Services in St Lucia. the rest of the afternoon. Can you help and what would be the cost? We have a party of 8 adults travelling on the Emerald Princess Cruise Line, arriving in St. Lucia on January 11, 2011, for the day. We would like a private tour of the island, either by land or sea (or a combination of both), and hopefully including a stop at Jade Mountain Resort for lunch, and seeing the amazing views of the Pitons as we dine. We want to tour the resort because the 8 of us are thinking of vacationing there next year for a week and we would like to see the property. In addition, we would obviously enjoy the drive-in volcano at Sulphur Springs, maybe the Diamond Botanical Gardens; and anything else you would suggest for our time frame. We are not interested in snorkeling, swimming, scuba diving, etc. - just to see the beauty of the island. suitable for a three year old? Tour and the Rainforest & Waterfall Adventure. We are very interested to see the Pitons, a waterfall, volcano and swim. Do either of these tours have these things and how much does it cost? More St. Lucia Shore Excursions & learn about shore excursion reviews in St. Lucia.